I have promised this blog post for ages, since March, and only now I have finally got around to doing it. I reviewed the first book in the Blood for Blood Saga, Vendetta a few months ago. This is the second book written by Catherine Doyle and the second book in the Blood for Blood Saga. I tried to find out how many books are in a saga and I got a few different answers, I think it is between 4-6 books but if you know please comment below. Catherine Doyle is an awesome Irish author who I found out about on a whim when I was in Easons and saw it as apart of the 'Buy 1 Get 1 Half Price' deal and bought Vendetta. I feel in love with the book and waited 8 months for Inferno to be released. 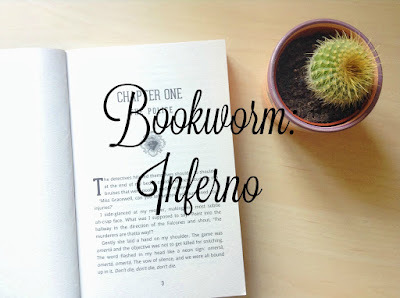 These books are very easy to read, I read Inferno, which is 400 pages long, in 8 days and normally I take my time reading books as I don't normally have the time to read a book cover to cover in a day. Inferno starts where Vendetta finishes off. Sophie is in hospital. She finds out the real reason why her father is in jail. Her life goes back to normal with a few bumps along the way until she finds out some family history that destroys everything that seemed normal. Sophie goes through a lot of raw emotions, she has to recover from the trauma of nearly being murdered in the first book and she grieves the death of a close loved one. It isn't clear what is going to happen next, all that is known is that Sophie is with the Falcones and somebody is going to die. I loved this book more than Vendetta, I feel like they are getting better with each one. Since it is YA fiction some parts a little predictable, I don't really mind this but I know some people dislike it. This book had me on a roller coaster of emotions from happy to extremely sad, I loved every chapter and every part. I have no faults except for *insert spoilers here*. It is one of the very few books that I can reread over and over again and not get bored and feel the same emotion as I did the first time I read it. Like the first one, Inferno has a cliffhanger. Thankfully all questions will be answered in the third book Mafiosa but unfortunately this book won't be out until January 2017 which is still a little while away. You can pre-order Mafiosa on Amazon, click HERE. Have you read any of Catherine Doyle's books? Thanks for commenting Laura! I 100% recommend to read it, I enjoyed reading them so much.